Heads up: Coach Tabbert gives Shannon DuLaney advice between matches as the Aggies battle the Zias. DuLaney had 26 kills in the game against NU earlier this season. Cameron fans lined up for the first home volleyball game of the season at 7 p.m. Sept. 17th in the Aggie Gym. Despite their practice, the team fell in straight sets to the Eastern New Mexico Zias. The Aggies, who lost 25-14 in their first set, were hurt by multiple errors. CU committed 14 errors on 45 attempts. However, the Zias only committed six errors on 40 attempts. “We just got beat tonight in every phase of the game,” said Head Coach Doug Tabbert. Despite this unfortunate loss to ENMU, who was seeded beneath the Aggies in pre-season polls, the team is staying positive and taking it out in the gym. In the second set, CU fell by a close 25-20, leaving them down by two matches. In set three, despite seven tied scores, the Aggies lost 25-18. Sophomore Kelle Carver led the Aggies’ offensive line. Carver had 15 total kills during the game. Kat Evans added six kills to the effort. Setter, Kayla Hebert added another double-double to her season with 30 assists and 11 digs. Lauren Acuna added 19 digs to the defensive effort, and Rebecca Green had four blocks. Courtney Lawson, who had 10 kills and 14 digs, led the Zias’ offense. Kaitlyn Maddams had six kills and 10 digs during the sets against ENMU. Karra Day had 31 assists, while Hayley Couch added 14 digs. The ENMU defense had a total of 10 blocks. Cameron was 4-5 following the sets against ENMU, with a 0-1 Lone Star Conference record, and Eastern New Mexico was 3-6, with a 1-0 LSC mark. The Aggies swung through Texas for a match with Tarleton State on Friday, Sept. 20, where they fell to Tarleton State. 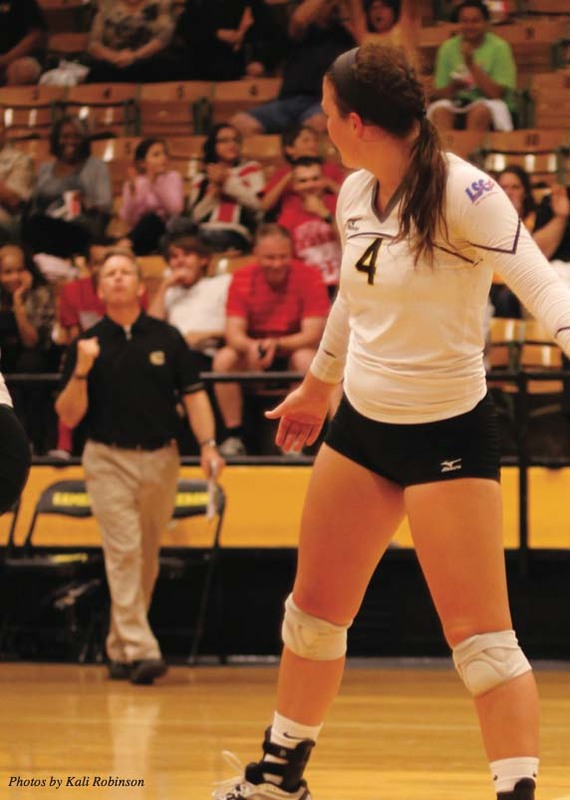 The Aggies won one of the four sets against Tarleton, and were swept by Angelo State the following day. The matches against Tarleton and Angleo were then followed by Texas A&M University and Texas Woman’s University, both in the Aggie Gym. The Aggies will next appear Oct. 1 in the Aggie Gym for a match against Saint Gregory’s University.